ST. GEORGE – The No. 9 Dixie State softball team cruised to a 10-1 victory in six innings over Colorado State-Pueblo on Friday at the Canyons Softball Complex in St. George. The Trailblazers (5-0) jumped out to an early lead, scoring three runs on three hits in the top of the first inning to build a 3-0 advantage. Bailey Gaffin brought the first run home with a single up the middle, while Jessica Gonzalez and Kenzie Sawyer also picked up RBI hits in the frame. Dixie State plated another run with a pair of hits in the top of the third, including an RBI-single to center field by Sawyer to push the lead to 4-0. The Trailblazers added another trio of runs in the top of the fifth with three hits and a CSUP fielding error, pushing the lead to 7-0. Dani Bartholf highlighted the inning with a 2-RBI, opposite-field double to right field. The Thunderwolves pulled a run back in the bottom half of the fifth with an RBI-single to trim the lead to 7-1. Dixie State closed the scoring in the top of the sixth, pushing across three more runs to extend the lead to the final tally of 10-1. Brenna Hinck opened the scoring with a home run to left field, before a CSUP fielding error allowed Riley Tyteca to score from third. Emma Sweet put the finishing touches on the win with a sacrifice fly to right field. Hinck led the offensive attack with a 3 for 4 performance and a home run, while Gaffin added three hits with an RBI. Alexis Barkwell (1-0) shined in her first start of the season, pitching a complete-game win with six strikeouts and just three hits allowed. Dixie State will continue play at the Easton Classic on Saturday with games against MSU Billings (10 a.m.) and Chadron State (12:30 p.m.). 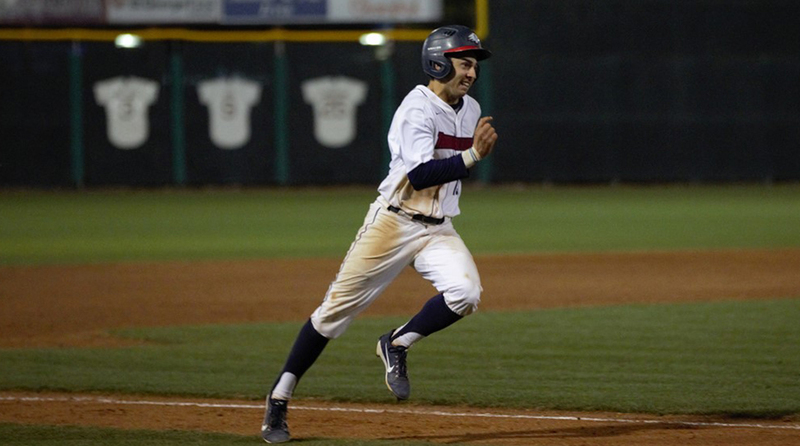 Dixie State’s baseball squad split a pair of games on Friday, falling in the early game to Montana State-Billings 15-7 before bouncing back to beat Cal State-San Bernardino in extra innings, 9-8. In the first game, the Trailblazers battled back from an 8-0 deficit to pull within 8-7. Freshman Alec Flemetakis hit his first career home run and Bryce Feist also homered as DSU fought back from 8-0 down by scoring two in the third, three more in the fifth and a run in the sixth and seventh innings. But MSUB pushed the lead to 10-7 with a pair of runs in the top of the eighth and put the game away with five in the top of the ninth. Dixie State had 11 hits in the loss, including two hits and three RBIs for Feist. But DSU pitching surrendered 16 hits and 10 walks in the loss. The night game featured Dixie State against the CSUSB Coyotes. It looked like an easy win for DSU as the Blazers cruised into the late innings with an 8-1 lead. Gabe Taylor had three hits and three RBIs and Jake Engel socked a three-run homer in the fifth to help DSU gain the huge advantage. Meanwhile, DSU starter Jayden Murray hurled two-hit ball for four innings and reliever Brecken Lewis shut CSUSB down in the fifth. But things came unraveled for Dixie State and reliever Jack Gonzalez in the top of the ninth inning. With two outs and one on, the Coyotes got a two walks and a single to make it 8-3. A dropped third strike and another hit brought home two more runs and it was 8-5. Dixie State brought in reliever Brad Danzeisen, but he couldn’t stop the bleeding. CSUSB got a two-run double from Gabe Chavez to make it 8-7 and then Mando Rodriguez laid down a perfect bunt to tie the game at 8-8. DSU couldn’t score in the bottom of the ninth and neither team scored in the 10th. Dixie State reliever Kyle Rosas allowed a hit in the top of the 11th, but no runs, setting up a big bottom half. Logan Porter led off for the Blazers by ripping a 3-1 pitch for a double to right field. Jagun Leavitt sac-bunted him to third, bringing up Kade Cloward with one out and Porter at third. Cloward worked the count to 2-2, then lined the game-winning hit to left field to give the Blazers their second win in three games this season. Dixie State plays two more games at Hurst Field on Saturday. The Blazers face Montana State-Billings at 11 a.m. and then battle San Bernardino at 3 p.m.